Exeter can be a truly cycle-friendly city. Ultimately Exeter should have a fully comprehensive cycle network where everyone can safely and conveniently cycle from A to B regardless of their starting point and destination. This means making every road, street and junction suitable for cycling. In order to achieve this, primary roads with high volumes of traffic and high speeds need protected space for cycling. Secondary roads might need protected space or traffic volume and speed reduction measures. Quieter streets are those with no through traffic and very low speeds where segregation is not needed. Off-road paths provide additional permeability to the road network giving people that cycle full flexibility for their journeys. 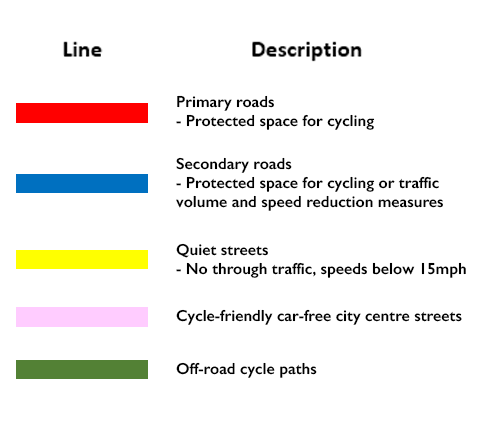 The plan below shows what we think this comprehensive network should look like using these road categorisations and what infrastructure measures would be required for the different roads. 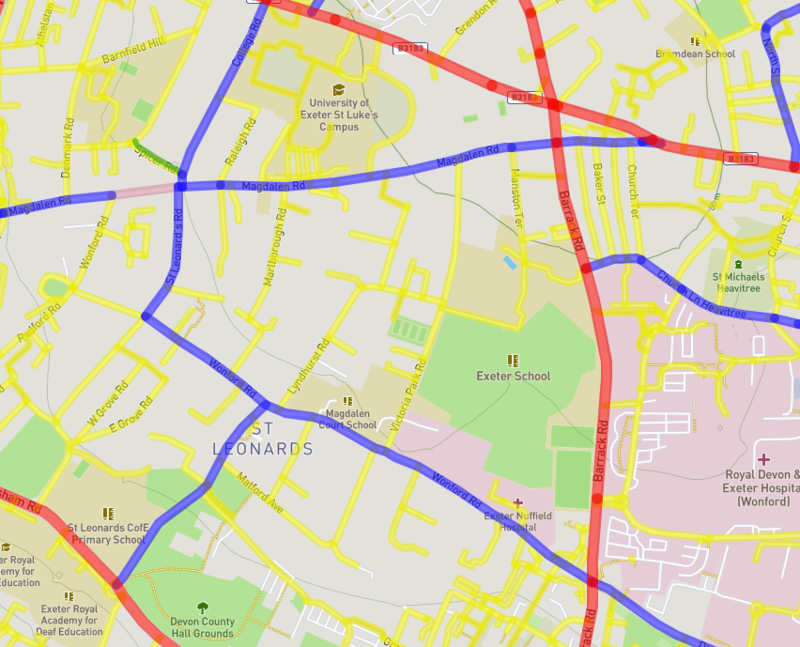 It shows the network of Exeter in 2030, not the current situation. For example, many streets that are proposed as ‘Quiet Streets’ are currently used as secondary roads for rat runs and would need interventions such as modal filtering to achieve the proposed category of a quiet street. The plan has been developed and refined through a collaborative open workshop between members of Exeter Cycling Campaign and residents of the city with a particular local knowledge. It has been formulated as a starting point to stimulate discussion rather than as a fixed final solution. We invite everyone to continue to share their thoughts and ideas with us.